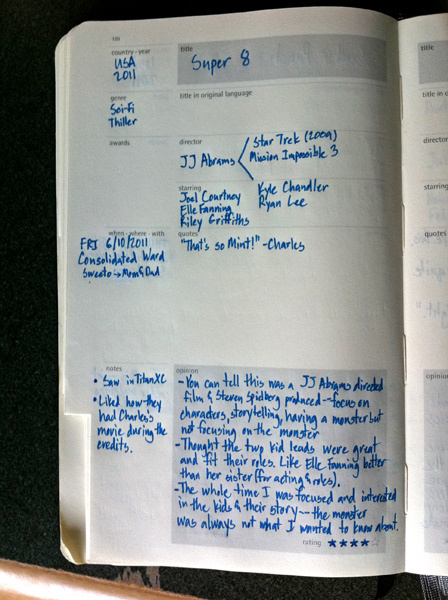 In an effort to keep up with my movie journal, I’m going to be posting images of entries from time to time. These aren’t going to be Earth shattering or anything, but it’s mainly a way for me to keep logging entries and to keep track of just how many movies I see during the year. Also, for more information about these films with a local perspective, here are few links to local reviews of these films (ok just Super 8 as no one reviewed Judy Moody). Hey, thanks for the link! 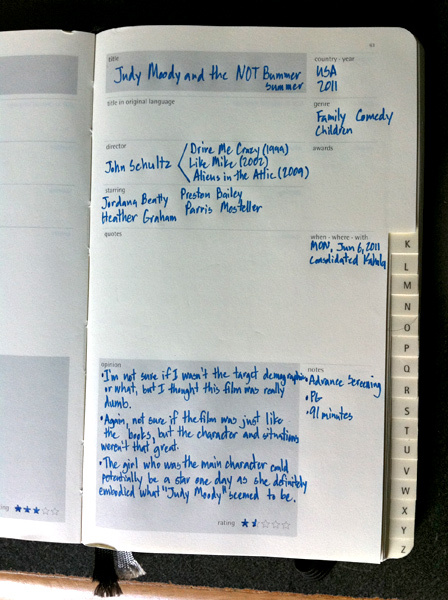 And very cool movie journal. Those are pre-made with the alpha-tabs and templates for movie notes? Never seen anything like it. Who sells them? You’re very welcome! I’m always interested to see who’s doing movie related stuff locally so when you guys decided to revive Popspotting, I knew I had to tune in. As for the journal, I got it as a gift last year. It’s a Moleskine journal and they have a “Passions Book” series which covers a bunch of different things people are interested. They’re great journals to begin with, but having a film one . . . pretty cool. Likewising Ryan’s comment! 🙂 Saw the ping come through and wanted to thank you again for the linkback. Myong has been notified! Yup, thanks so much the link and commenting on our site! Really appreciated. Your tweets are fun to follow as well! No thanks necessary. Like I was telling Ryan, I like seeing what everyone else locally is buzzing out at the theaters. Keep up the great writing! I like the fact you show off your Moleskine Passion Book in your review. I love my Moleskine in fact i have a whole blog dedicated to them (although it has been slacking as I’ve been busy with Nonstop). Awesome Sauce! Cool journal. With so many movies to see keeping track is a good idea. Not really a movie buff but might become one now. « No Texting During the Movie Please!